The pavilion is available to hire for private functions, meetings, parties, family gatherings and clubs on a regular or one off basis. The Pavilion is on the Wale Recreation Ground in Whittlesford Road, Little Shelford CB22 5EW. Set in delightful surroundings in this South Cambridge village the pavilion is bright and airy and provides a function room opening on to the recreation ground with excellent facilities. For sporting activities there are modern light and spacious changing rooms for both the home and away teams, and a separate officials changing room. Or alternatively contact Mrs Penny Saich on 01223 842737 or Email pandrsaich@btinternet.com. An Aerial view. Click here to see a video with collection of aerial views of the pavilion. The main function room with views out onto the Rec. The pavilion has a fully fitted kitchen with serving hatch to the function room. A timelapse video of the first phase of the build. The pavilion was opened on Saturday April 25th by Tony Lewis, Broadcaster and ex-England Cricket Captain. Tony Lewis (left) with Pavilion Trust Chairman Maurice Palmer. The opening was a fantastic village event, attended by over 300 people. A number of events accompanied the opening, including the Sawston steel band playing the famous test match theme tune, youth sports demonstrations beforehand, and 20:20 cricket match following, which the current XI won. The pavilion has received numerous compliments, including being 'tardis-like', bigger on the inside than it appears on the outside, which is worthy testament to Vic Franklin's design work. The Trust also made a special note of thanks to Cath Beal, who wrote, coordinated and submitted the grant body applications, without which the project could never have been completed. The opening also marked the award of 'Villager of the Year' to Maurice Palmer, chairman of the Pavilion Trust and project team. His unswerving dedication to delivering this facility to the community is now rightly recognised. The Pavilion Trust wishes to thank everyone involved in the opening for helping to make the day a huge success. 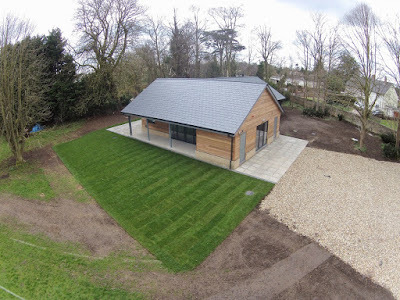 The Little Shelford Sports and Recreation Trust are proud to present the completed pavilion to the community. The Trust extend their thanks to the many people and organisations who have supported this project and helped bring it to completion.